If you haven’t been told specifically that your cast is waterproof it’s essential to keep it dry. Also note that even if your cast is waterproof that isn’t a license to get it soaking wet. You should still make every effort to keep water from getting between the cast and your skin. This is a sure recipe for an uncomfortable and sometimes smelly situation. Remember that you’re going to be wearing your cast for some time, so comfort is important. 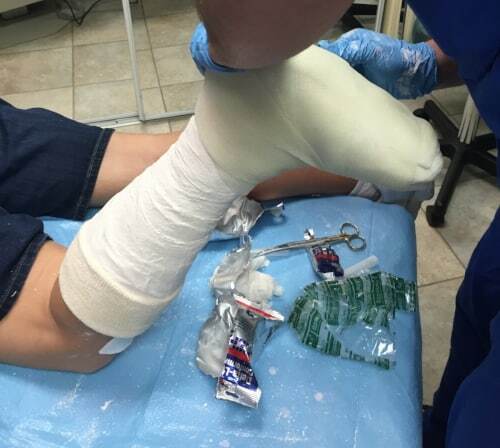 Even with newer, non-plaster cast materials, your cast won’t fully harden for 2-3 days. It’s important to avoid weight bearing during this time, provided that you should be bearing weight at all. This is especially true on hard surfaces. If your cast becomes dented, it can cause pressure sores to form. Be careful and use common sense. In general, not bearing weight on the injured limb for 48 hours is recommended. This holds true even if you’ve been given a walking cast. When you’re resting, try to keep the casted limb elevated above heart-level. This helps counteract the pull of gravity, and is especially important if you’ve got a leg cast. 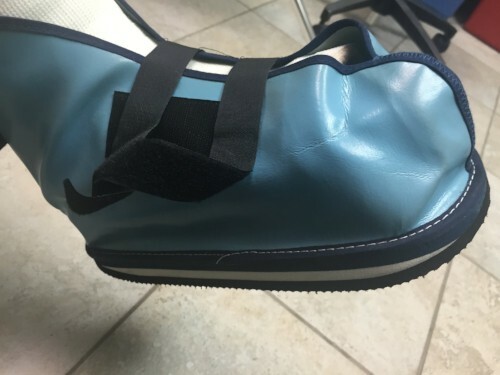 This will limit swelling and make sure your cast isn’t uncomfortably tight. Again, you’re going to be wearing your cast for some time, so comfort is paramount. When casted, use the opportunity to take it easy. Don’t put too many demands on your injured limb, and certainly don’t do anything which could re-injure it. It’s your cast’s job to protect your limb, but it does require your cooperation. If you’ve got a cast, then your injury itself is probably somewhat painful. If the pain gets steadily worse, however, it’s probably a sign that your cast is too tight. This can become quite painful, and is relieved somewhat relieved by elevation. If this is the case, simply contact your doctor’s office for a change of cast. Beneath your nails lies what is known as the nail bed, which is usually pink due to good circulation. To test this, press down on one of your healthy nails. The nail bed should turn white as blood is forced from it, yet should turn pink again within seconds. This is known as the blanching response. If the nails on your casted limb fail this test, or are gaining a bluish tint, contact your doctor immediately. This probably indicates that your cast is too tight and that you should be re-casted. An impaired blanching response is still a sign of reduced circulation, so be sure to bring this to your doctor’s attention even if this is the only symptom you’re having. ess, tingling, or a “pins and needles” feeling. If local anesthetics were used when your bone was set, some numbness in the following hours is normal. If this continues or becomes worse, however, contact your doctor. As with an impaired blanching response, numbness and tingling probably means that your cast is too tight. In rare cases this can also be a sign of nerve damage. As with an impaired blanching response, it’s important to run this past your doctor to rule out something more ominous. Finger or toe movement restriction. It’s normal to have some difficulty moving your fingers or toes due to your injury. If you’ve lost the ability to move them entirely, however, consult your doctor immediately. This is probably another symptom of an overly tight cast, yet in very rare cases it can signal nerve damage. Fingers or toes which are cool to the touch. It’s normal for patients to notice a slight temperature difference in the digits of the casted limb. This is usually due to the simple fact that you’re not using the limb as much as normal. As with the above situations, it’s probably a sign that your cast is too tight, but this is still a sign of impaired circulation. It’s best to err on the side of caution and call your doctor’s office. As mentioned above, keeping your limb elevated above heart level is a good way to limit swelling. In fact, it’s normal for most injuries to cause some degree of temporary swelling. Make sure to tell your doctor if swelling persists or increases though. This can potentially be a sign that your cast is too tight. You’ll still want your doctor to rule out any other problems though, however unlikely. If your cast shows outward signs of damage have it checked out immediately, even if it’s close to your next checkup. Even small cracks can mean that your cast is weakened and isn’t performing its task of protecting your injury. In cases such as this, it’s best to be overly cautious and have the cast replaced. Fiberglass is lighter in weight and stronger than plaster. In addition, x-rays can “see through” fiberglass better than through plaster. This is important because your doctor will probably schedule additional x-rays after your splint or cast has been applied. X-rays can show whether the bones are healing well or have moved out of place.